It was in high school when my two passions of science and food intersected in a physics lab. I was a student at the Chinese High School in Singapore, and the assignment was to take fresh duck eggs and immerse them in salt water. Through osmosis the brine would seep into the eggs and we’d measure the salt content over time. Although the science was fun, what I remember most was the delicious eggs that I took home to cook! Salted duck egg is one of the most versatile ingredients in Chinese cooking. It’s also one of the items that remain well below the radar of the average American diner. Raw duck eggs, both fresh and salted are common in Asian markets, but they are very hard to find in America. If you have access to raw duck eggs, it is possible to salt them at home. You can soak the eggs in a brine of four parts water to one part salt by weight. Although a simple salt solution is the usual brining liquid, rice wine, spices or chilies can be added to give an extra kick to the flavor of the eggs. Be sure to use enough solution to cover the eggs completely. You may need to weight them down to keep them fully submerged. Brine the eggs for 30 to 40 days. Once removed from the brine the eggs can be kept in the refrigerator for another month without spoiling. If you don’t have access to raw duck eggs you can buy them already brined at any supermarket in Chinatown. Raw salted eggs can be used as an ingredient in a variety of recipes. They can be braised with a vegetable, or steamed on top of a pork cake. They are also often served as a side dish to accompany porridge. If a recipe calls for the eggs to be pre-cooked, steaming is the best way. Place the eggs in a shallow dish and steam gently over simmering water. Salted duck egg is full of umami, a savory sensation, and is excellent for combining with other milder ingredients. A cold appetizer dish of tofu and salted duck egg yolk, of which I’ve included a recipe below, is one of the best ways I know to demonstrate how a full-flavored ingredient can make a bland ingredient absolutely delicious. There is nothing like tofu to elicit extreme reactions from people tasting it for the first time. They either love it or detest it. 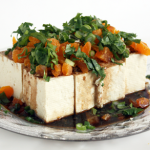 In spite of increasing popularity in recent years, tofu is still mostly consumed by health conscious people or vegetarians. This is not surprising since tofu, by itself, is rather bland. And in its most popular form has a jelly-like texture that’s not always appealing. However it is precisely these characteristics that make it a perfect canvas for showcasing flavors acquired from stronger ingredients like salted duck eggs. When you make this dish do an experiment by trying the tofu and salted duck egg separately before assembling the dish, then try them again together. You’ll be amazed at how complex the flavor of the finished dish will be. There, you too, can be a scientist who loves good food. Chop the salted egg yolks into roughly 1/8 inch pieces and set aside. Chop the cilantro and slice the scallion. Set both aside. Chop the garlic and fresh ginger and add all of the other dressing ingredients together and mix well to make the dressing. You can prepare all these ahead and assemble the dish at the last minute before serving. Just before serving unpack the tofu and drain all the liquid. 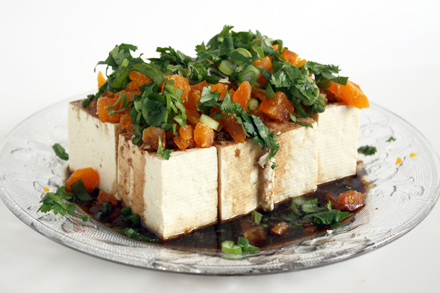 Cut the tofu into about eight pieces and arrange on a serving plate. Pat the tofu dry with a paper towel. Then pour the dressing over the tofu. 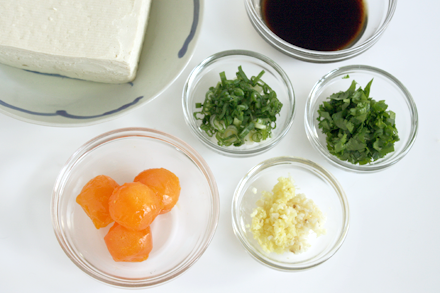 Garnish the top of the tofu with the chopped salted egg yolks, cilantro and scallion. Serve immediately. Do not prepare this dish too far in advance. The liquid will continue to leach from the tofu once plated. This will dilute the dressing and become messy. 1) Does if have to be duck eggs? What about Chicken (common) or Quail (quirky) eggs? Hi Sam, Thanks for your kind words. Yes, you can use chicken or quail eggs. But duck eggs create the best texture when brined. Brining is usually done at room temperature. The salt actually preserve the eggs at the end. Nice presentation. I’ve seen these before, and I’ve also seen the “1000 year old” eggs before. They have a beautiful, almost emerald yolk. Do you have any ideas for how to do them at home? I mean do you have to “roll them in pine ashes, cover with gardening soil in a crock, and cure for 100 days” ? The century old eggs are different from salted eggs. They are however both methods of preserving eggs. Century old eggs are made by wrapping them in a lime and ash mixture. Not commonly done at home. Century old eggs are readily available in almost all Chinese markets. I happened to have all the ingredients in my fridge so I decided to try this for lunch and I absolutely loved it! Thank you so much for the recipe. Nice pictures! I’m so glad you like the recipe. It is perfect for the warm weather. hoot… love this. it will be great in summer. This looks really elegant, but really simple. Just the sort of thing I love! You said you can use the already preserved duck eggs that you can find in Asian markets, correct? Thanks for sharing this dish. Margaret, Yes do use already salted duck eggs from the market. I’m sure you’ll love this recipe. Ana, save the egg white to accompany your plain congee. Or you can buy just the salted egg yolk already separated and wrapped in plastic. I effectively bought “salted egg yolk already separated and wrapped in plastic” as I plan to make mooncakes this year (at least I will try!). Do these egg yolks require steaming before use (like the yolks of whole salted eggs)? I bought them in a local chinese store and there is no indication on the package. 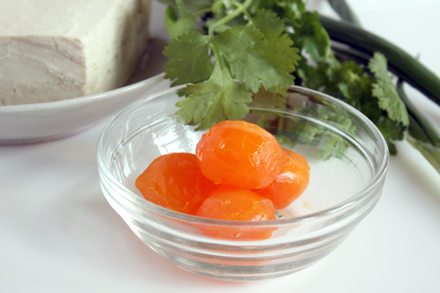 We already eat cold silken tofu with cilantro all the time, so it blew my mind to include salted egg yolk! I can’t wait to try it. I grew up eating it mixed with white rice. Any suggestions for what to do with the leftover salted egg white? It’s usually really salty. Okay, here’s a question…do you think Lucy will eat salted duck eggs? I ask, because she loves tofu, plain or in a dish and eggs in general. I loved yours and Robin’s ideas and was thinking I could turn this into something fun to eat for the kids. YumMum, Lucy will absolutely love this. The egg yolk taste like regular hard-boiled egg yolk, but salty. And if you can find fresh duck eggs upstate… make your own salted duck eggs. Lucy and Edie would love that! Thank you for this info! I raise ducks and recently one of my co-workers took a dozen of my duck eggs and made Salted Eggs! She gave me three of them and I’ve been wondering how to try them. This sounds delicious! Whoa, you were from Singapore? 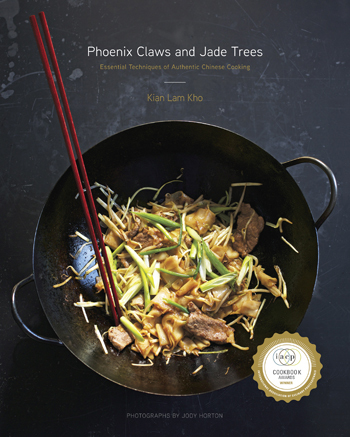 Hi, just stumbled on this websitee while searching for a gao li dou sa recipe! Nice blog, and thanks for sharing all your recipes and knowledge! Can’t wait to try them. I like the texture of tofu, but not the taste–so I like eating it Agedashi style, fried and coated with loads of bonito flakes and sauce. I think there’s a chinese dish where salted eggs are fried with tofu right? I might be wrong. Anyway once again, great website! Thanks for the kind words. I love tofu in all its infinite variety of forms and preparations. There are a few different ways to fry salted eggs with tofu. You can either deep fry the tofu first then stir-fry with chopped cooked salted eggs, or just simply stir-fry regular tofu with chopped cooked salted eggs. Regardless of how it’s prepared I love the intense flavor of salted duck eggs. Made it again, this time for dinner with partner, who loved it too. It’s really so very nice on warm days. I can’t imagine anybody not loving this. Really. I miss salted eggs especially when I return home to Singapore and see salted egg dishes sprouting everywhere. Have been thinking of salting my own eggs, but we can’t find duck eggs easily here in Italy. Wonder if chicken eggs will do. Hi, I love salted duck eggs, but right now they are not allowed to come into this country….not sure why. I make my own salted chicken eggs and steam them with ground pork-YUM! I do not understand, are you supposed to hard boil the salted eggs first or are they raw? 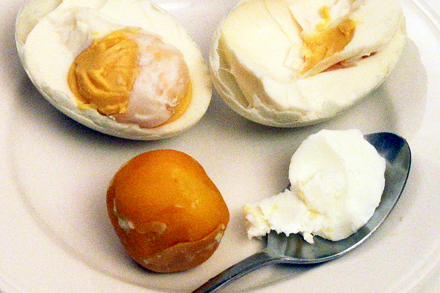 are the egg yolks raw or hard boiled? Wow! I’m so glad you actually made your own salted duck eggs. They are really delicious! I will definitely post more recipes using salted duck eggs.